Best of the Shelf Reviews are Toylab's place to review the best and most interesting comics on comic shelves right now. Today we take a look at the Marvel Star War series Doctor Aphra. Doctor Aphra is a new character to come out of Marvel’s take on the Star Wars universe and she now has her own comic series. Aphra is easily my favorite new character created in Marvel Star Wars comics which is no small thing because there are a lot of new characters. Best of all, I am happy to say that the new series does not disappoint. Who Exactly is Doctor Aphra? Doctor Aphra is like a female Indiana Jones with a darker side. She enjoys adventure but also has no problem lying, stealing or even killing to get her way in the world. With that edge she has no problem becoming an asset of Darth Vader or navigating the seedier sides of the Star Wars Universe. What makes her even more fun is that her adventures take her into historic depths and ruins of the Star Wars universe like a mean little Tomb Raider. Her companions are also fantastic and add layers of both depth and fun in the series. The one problem with Aphra in the Darth Vader comics is that the series was not able to focus on her and her past as a character. Now with the Doctor Aphra self titled series we are getting much more about her back story, and her relationships good and bad. Doctor Aphra is the first comic to focus on a character that was created in the Marvel Star Wars comics and not from the film or TV series. This makes the series more remarkable and really shows how strong of a character Doctor Aphra is. It would not surprise me to see her jump format and appear in other mediums in the future. One of the beautiful things about Doctor Aphra though is that she is unrestrained by the continuity and is free appear almost anywhere in the Star Wars universe. Where did Doctor Aphra come from? Doctor Aphra was first mentioned in Darth Vader #2 and shortly thereafter made her first appearance in Darth Vader #3. As Marvel is owned by Disney the same parent as Star Wars all of the Star Wars Marvel comics are considered canon in the Star Wars film universe. The Darth Vader series has been the most popular and critically acclaimed Star Wars series since Marvel took over the comic part of the franchise. Writer Kieron Gillen focused on an interesting moment in Darth Vader’s life to focus on new stories and uncover some lingering Star Wars mysteries. In Darth Vader, Vader is on the outs with the Emperor after the destruction of the Death Star is blamed on him. The identity of the mysterious pilot who fired the shot that destroyed the Death Star is being sought by Vader. He knows that whoever the pilot is they are strong with the force and either need to be brought into the fold or eliminated. Meanwhile the Emperor begins to toy with Darth Vader he initiates plans to create a replacement to Vader and basically through the series Vader is in an uneasy spot. While Darth Vader appears to be loyal to the emperor in the films, he does tell Luke in Empire Strikes back that together they could rule the galaxy. In that moment he reveals that he has his own ulterior motives but these plans are never touched on again. By the time Return of the Jedi rolls around Vader seems to be back to being the loyal servant of the Emperor right up until he tosses him into that pit at the end. The Vader Series is fun because it explores the plans and machinations of Vader and his building up of various assets. It also has him seeking out and eliminating those that would attempt to usurp his role as the right hand man of the Emperor. Doctor Aphra is one of the most important assets used by Darth Vader to do these plans. He runs into old droids that were reprogrammed by Doctor Aphra and then begins to put her to use. Aphra has managed to liberate two other artifacts from the Empire that end up taking the form of two murderous droids; the astromech BT-1 (BeeTee) and protocol droid 0-0-0 (Triple -0). These two droids are homicidal doppelgangers of C3P0 and R2D2 and provide laughs and action throughout the series. Black Krrsantan is a wookie, bounty hunter who also joins the group. He is very much like a bad Chewbaca doppelganger himself. Aphra and her droid companions then are tasked with building up resources for Vader that are unknown to the Emperor. Doctor Aphra becomes a critical in Vader’s uncovering the identity of Luke Skywalker as well as unraveling the Emperors plan to replace him. In the end of the Darth Vader series Doctor Aphra survives the service of Vader and fakes her death. She is then free to pursue her own ends. 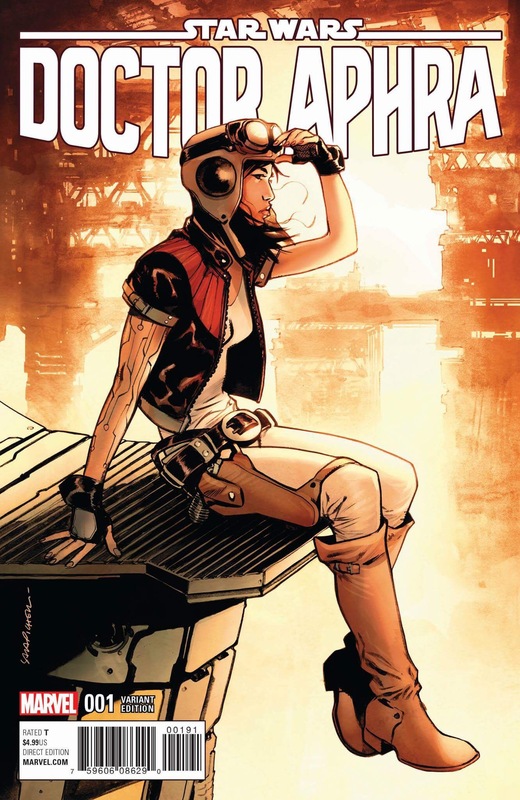 Which brings us to Doctor Aphra the self titled series! While Aphra has lived to survive another day she still owes a variety of crime lords including her partner Dark Krrsantan a ton of credits. She also has to constantly wrangle her two homicidal droids from causing too much chaos. Meanwhile, an important person from her past inserts himself in an ugly way. The series also begins to explore a mysterious group of force users who sought to use the force to achieve immortality. The group disappeared after battling the Jedi. Will new secrets allow her to find this long lost group? And will they good or evil? The art work in the series is done by Kev Walker and like pretty much everything in Marvel’s Star Wars comics it is fantastic. All of the ships, and creatures fit right in with the Star Wars mythos however right out of the gate the reader is given views of new creatures and new places. This is a key part of Aphra’s appeal is that much of what she sees and does is new. Writing wise Kieron Gillen does not skip a beat from the Darth Vader series and that is a welcome thing. Doctor Aphra is as spunky tongued as ever with the rest of her crew piling on dark humor. Pick up Doctor Aphra and settle back for an adventure to a variety of new and old places in the Star War universe.